During University I was an over the top pitcher and primarily used as a reliever but then transitioned to a starter in pro ball. I was actually moving up the ladder pretty quick but then I started having some arm trouble. Ending having Tommy John surgery. Coming back from surgery my stuff just wasn't as good and got moved to the bullpen. Throwing sidearm is actually something I used to do a little when I was 12-13years old for fun once in awhile in games. I grew up in Kansas City so watching Dan Quisenberry pitch my brother and I would always be fooling around in backyard pretending to pitch like him. I was in AA for the 6-7th season and was just fooling around in the OF, dropping arm down and started to see some good movement and action with the baseball. Talked to my pitching coach and he liked it. After the 2010 season that offseason I decided to stick with it, after being back and forth a bit during the season. I was more valuable and effective to the Red Sox as a sidearm lefty and finally got called up to the Big Leagues in 2011 after 7 seasons in the Minors. 95% of pitchers are from over the top, so when you have someone from a lower arm angle that can set you apart. Can mess up the hitters timing the first 3-4 times facing you. The ball just does different things with the lower arm angle. I like to call it 'bowling ball' spin. You are able to get that good sink on the fastball. As a lefty there really isn't many that pitch from that low arm slot so it is unique. Also just the deception that you get from there, for me a lefty when facing a lefty, I'm all the way on the first base side of the rubber so the pitch looks like it is coming right behind them when facing me. I don't think so. After Tommy John surgery, my stuff didn't' come back. I was 87-89 from over the top but then with sidearm was still 85-87 but with sink. Essentially went from flyable pitcher to ground ball pitcher, definitely the more ground balls can get as a pitcher I think the more successful you are going to be. Guess also ended up making it to the Big Leagues finally too after deciding to drop down. I would say to not start dropping down at to early of an age. Once you make the change in arm angle there is no coming back. If you are a pretty athletic individual I think the transition will be a lot easier for you. I'd say if you are pretty stiff, a traditional over the top guy it's gonna be tricky. I think pretty much at one time or another every pitcher has fooled around and dropped down in the OF doing flat grounds, hey look at this etc..you can kind of just tell who it could possibly work for. You need to take 100% ownership of your new arm angle. Basically there are a lot of similarities between over the top and dropping down. Main difference is really just that you are bent over at the torso. 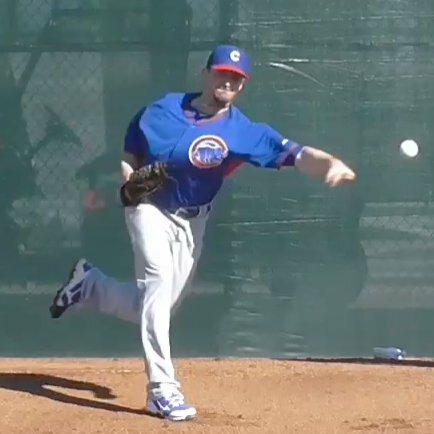 Arm still needs to be in a good throwing position upon foot strike. To get that good movement on the ball you need to stay behind the ball and stay nice and loose to get that nice whip in your arm action. As sidearm pitcher it's more about movement and you really have to just trust your stuff, can't force that movement to happen. 2 seam fastball, slider, changeup..will still go over the top with a fastball or curveball to a righty but 98% from down under now. As lefty pitcher, vs a righty just really try and get early count ground balls and attack the zone. Vs. lefties, just with the matchup and have the advantage looking for weak contact or the strikeout. For me it's just different than most pitchers. Always fun when start warming up in bullpen and get a little reaction from the crowd. Guess also after 23yrs of playing ball it's kind of like being a kid again. Kind of like wiping the slate clean with a new start and re-learning again.